There are 2 main ways to answer this question. Because it really depends enormously on which lottery game you are playing. 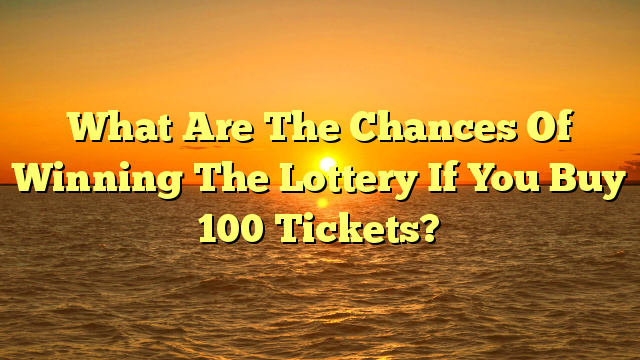 The simple answer is that you have 100 times the chance of buying 1 ticket. That is, if you normally buy 1 ticket and now buy 100, then your chances of winning have gone up by 100 times (or 10,000% if you like percentages). SIDENOTE: I should point at this stage that by ‘ticket’ I’m referring to a single combination, entry or set of numbers. Not an actual physical ticket which may have multiple entries on it. If however you normlly buy 10 tickets, and instead buy 100. Well that would mean your chances are 10 times better (because you bought 10 times as many tickets as before). The real underlying answer to this though does depend on what lottery game you are playing, and the odds of winning that game. Because generally what we really care about is what our actual odds of winning something are, rather than just how much better they were than before. So let’s say we are playing a fairly standard 6 from 49 game (where we pick 6 balls out from a pool of balls numbered 1 to 49). Your odds of matching all 6 balls and winning the jackpot are 1-in-13,983,816. Because that’s how many different possible combinations you can make if you pick 6 balls. To figure out what your odds are if you buy 100 tickets, all you do is divide this big number by the number of tickets you bought. 13,983,816 / 100 = 139,838. Which means your jackpot odds are now 1-in-139,838. Which is a much more sane looking number, but still quite large. What About Easier Games Like Pick 3? If however you were playing a game like Pick 3 where there are only 1,000 combinations in total (everything from 000 right up to 999), then things are very different. Here your odds start out as 1-in-1000 (because there are 1,000 possible combinations). So if you divide that… 1,000 / 100 = 10. Which means if you play 100 different tickets on Pick 3 your chances of winning the jackpot are as good as 1-in-10. Which is a 10% chance. Of course, the big difference is that if you win a 6 from 49 game you’re going to be banking a jackpot of a million or two. With a Pick 3 jackpot you’re not going to be quite as happy. There is one more thing you should take into account. The jackpot is not the whole story. With most lottery games there are numerous tiers of smaller prizes. These tend to range from hundreds of thousands right down to maybe a dollar or a free ticket. And of course the odds of winning these smaller prizes are much better. Going back to our 6 from 49 game again, what do you think the odds are of matching 3 of your 6 numbers? The math is horrible, so let’s just put that aside, the answer is 1-in-57. Following what we did above, that means if you play 100 tickets, the odds are 57 / 100 = 0.57 ..! Well maybe. But what that really means is that your chances of winning are actually 1-in-0.57. Which is better than 1-in-1. To actually convert this into something sane looking, we actually do a bit more math (sorry!). We multiply that 0.57 by ‘something’ to make it equal ‘1’. And given the laws of math if we multiply one side by this we have to do it to the other side as well. What we actually do here is 1 / 0.57 = 1.75, then multiply the other side by that. But you get the idea, right..? Long story short we get 1.75-in-1. Or nearly 2-in-1 if that’s easier to understand. Which basically means you’re pretty sure of winning TWO match 3 prizes if you play 100 tickets. How sure though depends on how you arrange your combinations. What we’re talking about here is using ‘wheeling systems’. These can be very powerful, and very confusing if you listen to the wrong people! But I’ll get into detail about those another time.